Christopher Dean, founder of The Timbered Wolf, grew up in Richmond, where he gathered an appreciative knowledge of the time-old trees of the area — Hollywood Cemetery’s Sycamore’s, The James’ Bald Cypresses & Red Cedars, St. John’s Walnut trees, and many more. Through the years and over the course of many travel adventures, Christopher learned the skill of reading tree’s fingerprints and how to work with the materials they leave behind after death. Today, Christopher creates relief prints from the giants he grew up with in extremely limited quantities. Christopher’s story is one of American perseverance. Through the hardships faced, a bond grew between the wood and Christopher. He began to understand its structure, its color, its feel. As The Timbered Wolf gained momentum, his creativity started to flourish, his quality shot through the roof, and his determination solidified. Whether it’s creating a Relief Print or making a cutting board, butcher block, or handcrafted table, every piece of wood that passes through Christopher is approached with the same mentality as when his journey started. We’re offering Christopher’s 14″ x 11″ Relief Prints in our Grid maker shop for the holidays, all hand pulled, signed, and numbered. All profits of relief prints go directly to the purchase of more ink, paper, and materials to continuously create prints of new species and pay for costs associated with printing and preparing for the upcoming curated collection of Christopher’s prints, The Book of Trees. In addition to Relief Prints, we’re also featuring limited edition diagonal stools and end grain chaos tables handmade by Christopher. The handmade stools are 22”-28” tall with a 15”x15” seat. Base options include black and white base options. All stools are made to order and take 2-4 weeks to complete. And the end grain chaos tables (made of Chechen, Figured Walnut, Maple, White Oak, & Padauk) are 48”x 24” x 28-30” d. All tables are built at time of order, and may take up to 30 days to complete, as all parts are labor intensive and done by hand. Upon placing your order, Christopher will contact you to discuss inset legs and apron. And he’ll remain in constant contact with you with progress photos and for any preference based questions and concerns throughout the build process. 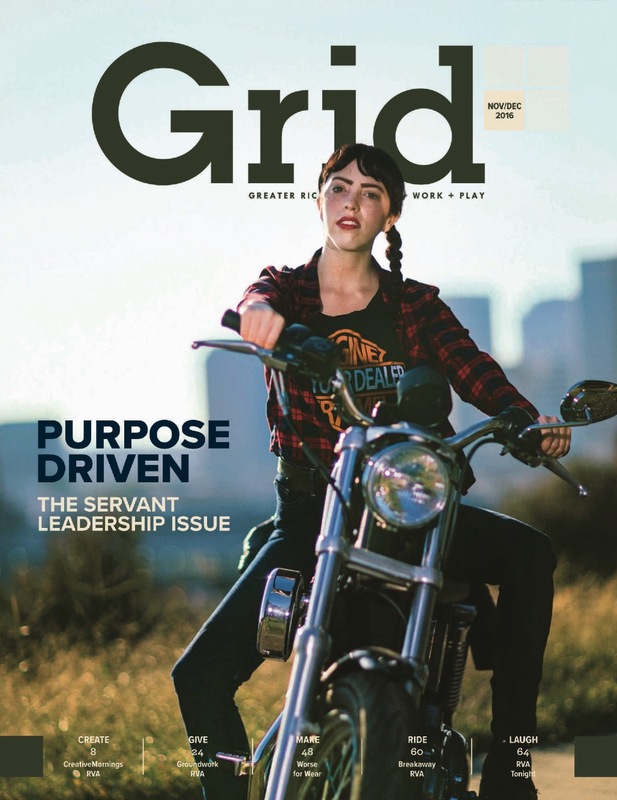 Grid is a solutions-oriented news platform that celebrates makers, storytellers, and community builders. Our goal is to share stories about people inspired by a purpose beyond themselves. We are interested in hard work, humility, authenticity, and stewardship. And most of all, people who roll up their sleeves and push Richmond forward.